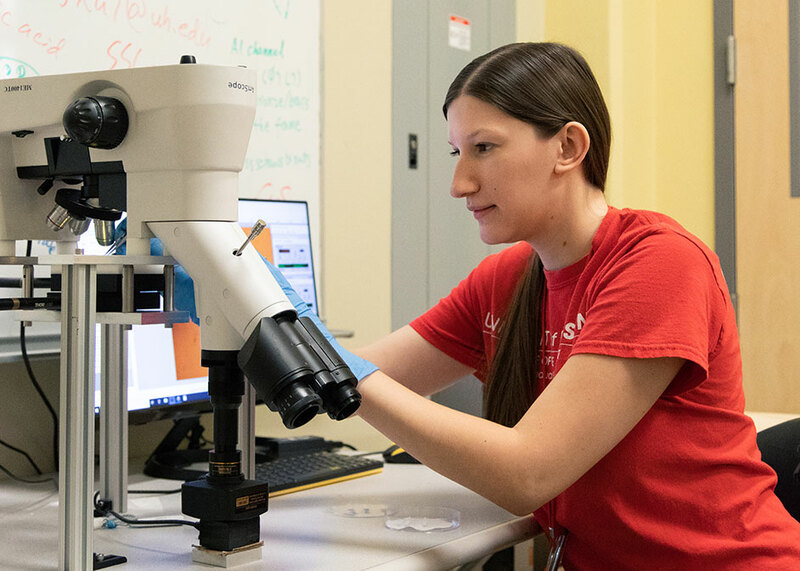 Miriam Gavriliuc, a second-year Ph.D. student in biochemistry at the University of Houston, was awarded a National Institutes of Health predoctoral training fellowship. This fellowship is administered through the Houston Area Molecular Biophysics Program (HAMBP), which is a collaborative graduate program with faculty from six Houston universities. Miriam Gavriliuc, a Ph.D. student in biochemistry, studies the mechanism of protein production. Renewable for up to three years, the fellowship supports Gavriliuc’s research on ribosomal translocation by providing her with a yearly stipend, tuition assistance, health insurance, and providing support to attend national conferences. Her research is conducted under the guidance of Yuhong Wang, associate professor of biology and biochemistry in the College of Natural Sciences and Mathematics. Gavriliuc studies a protein, called Elongation Factor G, or EFG for short, which facilitates protein production. EFG works by moving messenger RNA, which acts as a template molecule, through the ribosome. This links different amino acids together, forming the peptide chains which make up proteins. “Without EFG, the reaction would be extremely slow,” Gavriliuc said. EFG provides the ‘nudge’ needed to make the reaction run quickly and smoothly. As to exactly how EFG works, this is still an unanswered question. To study EFG’s mechanism, Gavriliuc is using a technique developed by her advisor in collaboration with associate professor of chemistry Shoujun Xu. This technique, called Force Induced Remnant Magnetization Spectroscopy, or FIRMS for short, measures the force by which EFG moves the ribosome. Gavriliuc will perform a series of experiments to determine the force by which EFG moves the ribosome, which will provide insight into its mechanism. One advantage of studying EFG is that it is a protein specific to bacteria. In addition to gaining insight into how protein production works in humans, understanding EFG-specific mechanisms can also offer an alternative target for antibiotics. During the course of this fellowship, Gavriliuc will be taking courses at different institutions, while also benefiting from the connections offered by the Gulf Coast Consortia. “This will give me the opportunity to meet people from different institutions,” Gavriliuc said.